• Sensor Length up to 300"
The 953A VMax is an accurate, programmable zero & span, auto-tuning, non-contact linear position sensor in a rod-style package. The sensor utilizes our field-proven Magnetostrictive technology to give absolute position, accurate to 0.01% of the programmable sensing distance. A variety of analog voltage and current outputs are available. All units have a diagnostic LED to display the health of the unit and to help aid in troubleshooting. Our Analog units offer programmable Zero & Span points; the analog output is programmable over the entire active stroke length. Units can be ordered in span lengths from 1” (25mm) to 300” (7.6M). 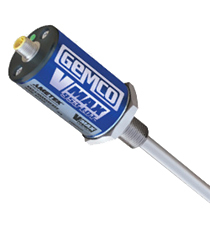 The 953D VMax is an accurate, programmable, auto-tuning, non-contact linear position sensor in a rod-style package. The sensor utilizes our field-proven Magnetostrictive technology to give absolute position, accurate to 0.01% of the sensing distance. A variety of digital outputs are available (Start/Stop, PWM & Control Pulse). All units have a diagnostic LED to display the health of the unit and to help aid in troubleshooting. Units can be ordered in span lengths from 1” (25mm) to 300” (7.6M). The 953S VMax is an accurate, programmable, auto-tuning, non-contact linear position sensor in a rod-style package. The sensor utilizes our field-proven Magnetostrictive technology to give absolute position, accurate to 0.01% of the sensing distance. SSI (Synchronous Serial Interface), 24, 25 or 26 Bit, Binary or Gray Code, Position Updates. All units have a diagnostic LED to display the health of the unit and to help aid in troubleshooting. Our Analog units offer programmable Zero & Span points; the analog output is programmable over the entire active stroke length. Units can be ordered in span lengths from 1” (25mm) to 300” (7.6M). Withstand hand shock & vibration, as well as high pressures and temperature swings.